Horse hoof conformation is the result of over 50 million years of equine evolution. But surprisingly both wild and domesticated horses share a similar hoof shape and function. The modern day conformation of the horse hoof is a result of the progressive evolutionary loss of digits I, II, IV and V of the basal pentadactyl limb, with resulting changes in bones, joints and the hoof capsule. This resulting conformation allows a strong heavy body to move with high speed on any ground but most efficiently on open, hard, flat areas like prairies and deserts. If your horse is shod you must ensure your horse or pony maintains a healthy balanced hoof and foot and that it is shod every 4-6 weeks. If your horse or pony is unshod (if it is a youngster or not used for ridden work) it should have a trim and leveling about every 8-10 weeks. Your farrier should be qualified and registered, and should advertise this fact. It is illegal for anyone other than a registered farrier to shoe or trim your horses feet. You must also ensure your horses feet are picked out using a hoof pick at least once a day, to remove any stones, mud and dirt and to check that shoes are in good condition. Keeping feet clean and dry wherever possible helps prevent problems, however a weekly 15 minute soak will help moisturise the hoof. Fans of the barefoot horse claim that hoof strength can be completely restored to domesticated horses if appropriate trimming and living conditions are applied. So much so that horseshoes will no longer be required for almost any horse. The hooves of barefoot horses and ponies, and especially those that live on pasture, tend to be well-shaped, with wide, healthy frogs and good concavity of sole, and made of tough, good-looking horn. These horses are rarely lame and the horses are sure-footed and will go confidently on any footing, even over rocks. However, you cannot simply remove your horses shoes and ride it, you must still consult a qualified farrier to ensure proper barefoot trimming and allow your horse time to develop strength in the hoof wall and sole. There are also many other considerations, which we will try to cover separately, depending on the type of ridden work you will do with your horse. Relative to size and body mass, the feet are proportionately small. There is a propensity to breed for small feet in Thoroughbreds, Saddlebreds, and American Quarter Horses. A small foot is less capable of diffusing impact stress with each footfall than a larger one. On hard footing, the foot itself receives extra concussion. Over time, this can lead to sole bruising, laminitis, heel soreness, navicular disease, and ringbone. Sore-footed horses take short, choppy strides, so they have a rough ride and no gait efficiency. If the horse has good farrier and shoeing support, it can comfortably participate in any equine sport, although it is more likely to stay sound in sports that involve soft footing. Large in width & breadth relative to body size & mass. May have slight pastern bones relative to large coffin bone. Flat feet limit the soundness of the horse in concussion sports (jumping, eventing, steeplechase, distance riding). 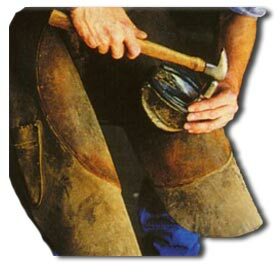 Without proper shoeing or support, the sole may flatten. 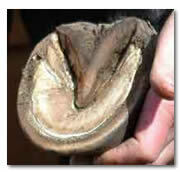 Low flat soles are predisposed to laminitis or bruising. The horse takes on a choppy short stride. It is hard for the horse to walk on rocky or rugged footing without extra protection on the hoof. A large foot with good cup to sole is an ideal foot for any horse. There is less incidence of lameness and it is associated with good bone. 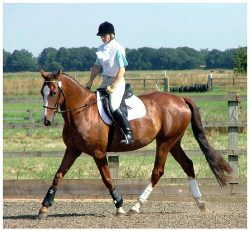 For flat footed horses sports with soft footing and short distances like dressage, equitation, flat racing, barrel racing are best.